Calex short wavelength (2.0 to 2.6 µm) infrared temperature sensors are suitable for accurately measuring the surface temperature of non-metals and some metals at high or low temperatures. 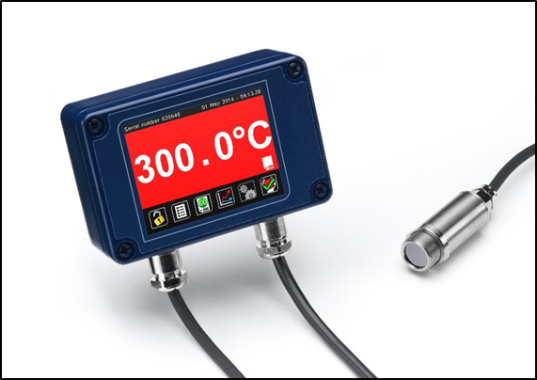 These sensors have adjustable emissivity settings, reflected energy compensation and peak and valley hold processing, making them particularly suitable for measuring hot objects in a furnace or on a production line. The short measurement wavelength enables temperature measurements to be made through glass and quartz, as these materials are usually transparent to infrared radiation at these wavelengths. These sensors can therefore be used with viewports made of glass or quartz, as well as other specialist infrared-transmissive materials. This is a brief summary of the features of our short wavelength sensors (PyroUSB, PyroMini2.2 and FibreMini) to help you choose a sensor for your application. The PyroUSB infrared temperature sensor model PUA2 has a 4-20 mA output, is fully configurable via a USB interface, and has a fast 200 ms response time. Several options are available, which differ in their measurable temperature range (within the limits 45°C to 2000°C). A wide choice of optics is available (15:1, 25:1, 75:1 or close-focus) making it possible to measure targets of almost any size at any distance. The sensor can be mounted using optional fixed or adjustable mounting brackets and the optional laser sighting tools can be used for accuracy in sighting the target. An optional air-purge collar can help keep the lens free from dust and condensation. The sensing head operates at ambient temperatures up to 70°C without cooling. For operating at higher ambient temperatures, there is an optional air/water cooling jacket with air purge collar. Software (CalexConfig for a single sensor and CalexSoft2 for multiple sensors) is free to download from our website. 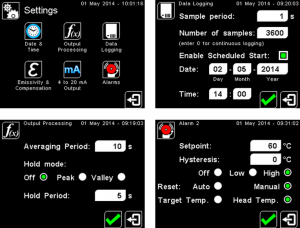 This simple to use software enables sensor configuration, emissivity adjustment, peak/valley hold processing, temperature display, scrolling temperature chart, on-screen alarms and data acquisition to Excel-compatible .csv text files. 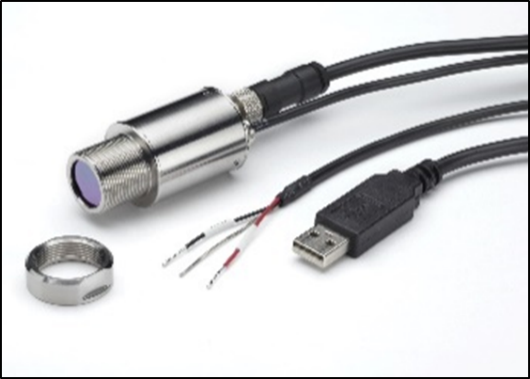 The PyroMini 2.2 sensor has a miniature sensing head, making it ideal for use in confined spaces, along with a separate electronics module. This sensor has a fast response time of 240 ms and the output can either be 4-20 mA or RS485 Modbus (up to 247 sensors can be connected via the RS485 network). The sensing head operates within the ambient temperature range 0°C to 70°C without cooling. A choice of measured temperature ranges is available within the limits 100°C to 2000°C; and of 15:1, 25:1, 75:1 or close-focus optics. Optional accessories include a fixed or adjustable mounting bracket, laser sighting tools and an air-purge collar. There is an optional touch screen interface which is mounted in the lid of the electronics module. 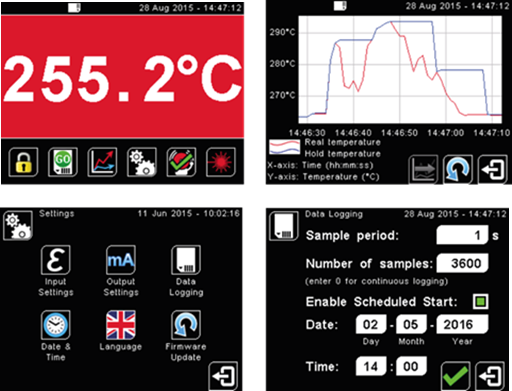 The interface enables sensor configuration, emissivity setting adjustment, reflected energy compensation, temperature display, alarms, a scrolling temperature chart, data averaging, peak and valley hold processing, and data logging to an optional MicroSD card. Sensors with a 4-20 mA output without the touchscreen have their emissivity settings adjusted via two rotary switches inside the electronics module. The FibreMini sensor also has a very small sensing head, making it suitable for use in confined spaces. The fibre optic sensing head withstands ambient temperatures up to 200°C without cooling, making it ideal for mounting in harsh environments such as near furnaces, and contains no electronics, allowing improved resistance to electromagnetic interference (such as in induction heating applications). 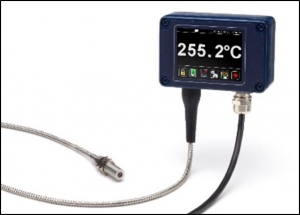 Two temperature measurement ranges are available, 250°C to 1000°C or 450°C to 2000°C. It has a highly flexible fibre-optic cable (available in lengths of 3, 5 or 10 metres), which can fit in conduits with tight bends, and provides built-in laser sighting as standard, which shows the location and size of the measured spot on the target surface during measurements. The sensor has a choice of 4-20 mA or RS485 Modbus outputs, 30:1 or 75:1 optics, a fast 125 ms response time and two alarm relays. It has a touch-screen interface for sensor configuration, adjustable emissivity, temperature display, scrolling temperature chart, on-screen alarms and data acquisition to Excel-compatible files. Optional fixed or adjustable mounting brackets and an air-purge collar are available. For further advice on our short wavelength sensors, please get in touch with us and we will do our best to help you.